I was at an Irish Business and Arts networking Seminar last night and Black 47's Lead man and all round great guy Larry Kirwan said in music You have to have a plan ... man. And he is right - I gotta have a plan. So my plan if I want to keep playing, recording writing and living music is one where I get to earn a living. So I have a band now that does just that. I am well used to being the solo guy with a guitar so now added to that awesomeness (that's an americanism I picked up) is an Aedel like singer a drummer/percussionist & a bass player plus an accordion instrumentalist giving an Irish flavor or banjo/mandolin player for a blue grassy Pogues feel. 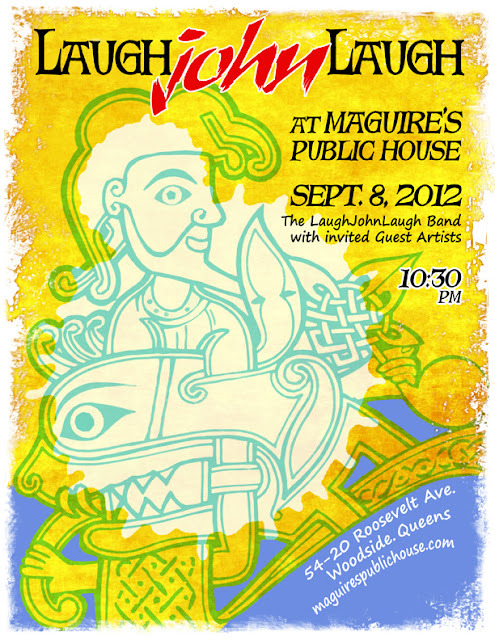 The LaughJohnLaugh Band with invited guests artistes appears late night in Woodside, Queens . A Steve Jobs letter found - the iMan continues to instruct from beyond- Give it away now. Steve Jobs Startling New Apple Letter. In a startling find from beyond the grave the founder of Apple, Steve Jobs has left a revealing and illustrative letter about his generosity and desires to share the benefits of Apple consciousness with all the world. The typed note accompanying some lyrics was found in his personal effects and annotated with his unique personal handwriting. "if I get a Billion from those MoFo Samsung fuckers then I'll give it away now too" The phrase 'give it away' was underlined several times.